Two recent Associated Press dispatches have exposed how out of touch two of its reporters are with the dominant Second Amendment-defending views of voters and politicians in Texas. They also are flummoxed that most of the students who survived Friday's school shooting in Santa Fe haven't turned into rabid gun-control advocates. The obvious undercurrent is "What's wrong with these people in Texas"? The 1.2 million open-carry stat gives readers unaware of Texas's decades of explosive population growth the impression that the state is still a 19th century Wild West culture, even though that number represents less than 6 percent of all Lone Star State's adults. 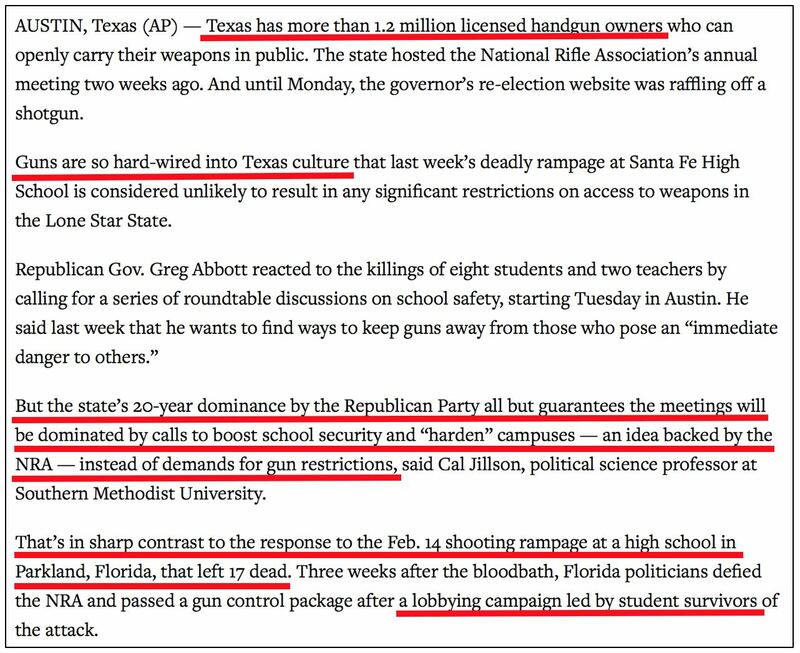 Weissert and Vertuno appear to have borrowed verbiage from the New York Times, which, in a Sunday evening report appearing on Monday's front page covered by NewsBusters' Scott Whitlock, described Texas as "a place where guns are hard-wired into the state’s psyche." Actually, as Powerline's John Hinderaker observed on Monday, "Those measures certainly would have been ineffective." The sentence especially when corrected, begs an obvious question: Why should these roundtable discussions waste time on ideas that the AP reporters themselves acknowledged wouldn't have worked? They've essentially admitted but still can't fully process the idea that focusing on "boosting security" would make far more sense. (Final two items) The contempt, rephrased, is now, "What's wrong with these Santa Fe students?" As to Parkland, the idea that a group of high school kids "led" the gun-control lobbying campaign and acted entirely on their own is absurd. Of course, they were presented as the face of the campaign, but the far-left Buzzfeed acknowledged that they had the financial and PR backing of "some of the largest organizing groups in the country." Early Tuesday, Vertuno authored a similarly headlined but separate piece containing much of the same verbiage. Vertuno extended the quote from Cal Jillson, the prof cited in the Monday dispatch, who complained that "Even the young people from Santa Fe are not full-throated advocates of gun control to keep the children safe." Apparently the only "changes" the AP reporter would consider "major" are ones that restrict Second Amendment rights — even though they wouldn't have done anything to prevent the Santa Fe massacre.